Toshiba Satellite C55D-A5120 PSCFWU-03H02X is a 15.6 inch computer for those on a budget- students or anyone that don’t want to spend a lot on a computer but would like something with adequate specs and features that will handle their daily computing tasks- which include an ergonomic keyboard with a responsive touchpad, a quad core processor, portability, build quality, nice looks, useful connectivity ports and affordability. Toshiba Satellite comes with a 64 bit quad core AMD E2-3800 accelerated processor at 1.3 GHz speed- which is more or less like an Intel Celeron level processor in terms of price but a bit more powerful, 4GB DDR3 SDRAM memory to enable efficient multitasking, 500GB Serial ATA HDD hard drive at 5400rpm rotating speed that may appear to be the standard size and speed but definitely more than enough for most computer customers and fast enough read and write times. You may be biased towards Windows 8 operating system if you’re more used to the previous Windows 7 but the Windows 8.1 that comes pre-installed on this system is definitely more user friendly with its additional tools and runs smoothly overall and doesn’t seem to cause lags or freezing, also with the good amount of RAM (that is expandable to a maximum of 16GB) and the decent AMD processor for how much this machine costs. 15.6 inch LED-backlit TFT HD widescreen display with 16:9 cinematic aspect ratio, good viewing angles, 1366x768 pixel resolution and AMD Radeon HD 8280 graphics card offers decent image quality for still photos, videos and games. Graphics card or the CPU is not suitable for playing the more advanced games but fine for multimedia editing up to a certain degree. Resolution+ feature transforms your regular definition content to much better and clearer- more realistic high definition quality image. Sound is OK and nothing extraordinary but adequate for this price level. Webcam with the integrated microphone is good for chatting on Skype with people and for taking still photos. You have both the HDMI port to let you hook up to a big screen HDTV to experience something like a home theatre at full HD supporting 1080p pixels and a multiformat DVD±RW/CD-RW drive to enhance your multimedia options. There is no Bluetooth but all you need is a Bluetooth USB dongle that will probably cost a few bucks, which you can order with the purchase of this computer if you feel that it is the right one for you. You also have the 802.11bgn wireless connectivity, Gigabit Ethernet with RJ-45, microphone and speaker output, VGA port, a Memory Card Reader to transfer files from different media devices, cameras and smart phones, 2 x USB 2.0 ports and a USB 3.0 port for much quicker transfer of data. Toshiba C55D with chrome accents looks a lot like the other PC laptops in the Satellite range. It weighs 5.3 pounds with measurements of 9.50 x 15 x 1.30 inches. The touchpad supports multiple gestures and the full-size keyboard is comfortable with the gaming command keys and a 10-key numpad for smoother entry of data. The 6-cell lithium ion battery is reported to normally give you around 5-6 hours on a single charge. Conclusion: Toshiba Satellite C55D-A5120 is a decently working and portable computer at 5.3 lbs weight and with a sufficient processor power and speed for day-to-day basic things so it is not so much for advanced users. 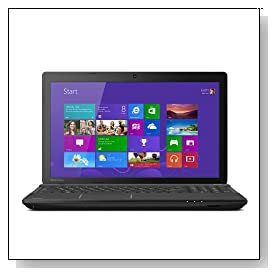 What is lacking is the Bluetooth connectivity and the Windows 7 operating system for those that are not into Windows 8 and the average sound quality. But the display is sharp, the quad core AMD processor is more or less an equivalent of the entry level Intel i3 processor, has a good enough graphics card for many games, it is easy to set-up and use, energy efficient, internet connection is fast enough and more.. So it is ideal for anyone that is on a tight budget and looking for value for their money.